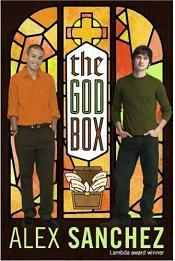 The God Box is a must read for every gay, lesbian, bisexual or transgender teen. The God Box is a great read! The God Box by bestselling author Alex Sanchez ("The Rainbow Boys" trilogy) is an important novel about gay teens and their Christian faith. TGB tells the fascinating story of gay teens and their non-gay friends who also happen to be Christians. In some ways, this book could be called an apologetic novel, that is, a novel meant to provide information about the practical realities of Christian faith. Alex Sanchez manages to achieve his goal while maintaining a fast-paced, captivating story. I have read the book and love it! I wish such an uplifting book had been available back in the 1960s when I was a gay teen. Sanchez addresses the questions teens ask about sexuality with unusual insight and sensitivity. TGB is set in a small west Texas town, with several Hispanic protagonists, giving it a wonderful multicultural dimension. Sanchez covers many gay themes and gay myths including ex-gay themes and how ex-gay ministries are so spectacularly unsuccessful. The fallacy of the ex-gay ideal and the sadness of gays who buy into the ex-gay myth is honestly portrayed without being preachy. TGB encourages authentic, Bible-based spirituality and demonstrates through literary device, how everyone should embrace the gift of our God-given sexuality yet in no way does Sanchez promote sexual promiscuity. The teen years are difficult enough without the complicating factor of being a gay teenager. Sanchez describes the trauma of teen bullying and the indifference of many teachers and school administrators when gay kids are bullied. A particularly poignant section of the book shows the horrific damage bullying causes to vulnerable kids and stresses the Biblical message of Jesus' incredible love for us. With exquisite finesse, Sanchez portrays the destructive manifestations of overt homophobia and internalized homophobia, and the inner torment of so many gay kids. In his fair and balanced treatment, he shows how some pastors fuel the inner torment of gay teens by appealing to their cultural prejudices and lack of knowledge. The image of God Sanchez paints in TGB is of a living, loving Savior who gave us a practical, relevant handbook for life in His written word, the Bible. If you have gay teenagers, TGB is must reading! This book encourages gay teens to live for the Lord, to not give up on God and to stay alive. Conflict over sexual orientation is a leading cause of teen suicide. The God Box provides a positive, scriptural antidote for gay teens considering suicide. For me, the one negative about TGB is the author’s comment in the back of the book where he commends Bishop Spong. As a Bible believing Christian, I CANNOT in good conscience, recommend ANY of Bishop Spong’s books. Spong’s denial of the virgin birth of Christ, his denial of the new birth through the substitutionary blood atonement of Christ, his denial of salvation by grace alone through faith alone in Christ alone and his denial of the inspiration of the Bible will only confuse and discourage gay Christians who seek answers in the Bible. Thankfully, the wonderful story Alex Sanchez tells in TGB does NOT embrace or recommend Bishop Spong’s infidelity and unbelief, which is why I am able to recommend The God Box. 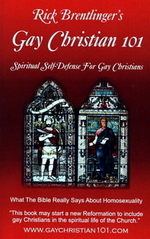 - Reviewed by Rick Brentlinger, Founder of GayChristian101.com and author of Gay Christian 101 - Spiritual Self-Defense For Gay Christians. 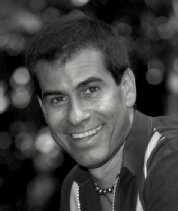 Find out more about Alex Sanchez at his website. From The God Box, return to Gay Christian 101 Home Page.